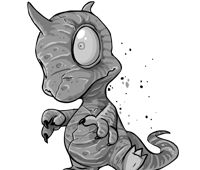 Tyrannians are well-known for their somewhat odd pastimes, and the latest Tyrannian craze, known as "Ugga Drop", is no different! It takes skill and quick reflexes to make it to the top in Ugga Drop, but most of all, it requires bravery. Why? Because you'll be jumping off rocks with only a parachute to slow your descent! You are about to send feedback on Ugga Drop. We would appreciate it if you could give the game a rating out of 10, and also tell us any additional comments you may have. Thank you for your feedback on Ugga Drop.